This page contains a chart (below) which tracks the ROMs known to exist which will run in a TRS-80 emulator. NO ROM CAN BE DOWNLOADED FROM THIS SITE; LINKS ARE TO GENERAL MACHINE DESCRIPTIONS ONLY. The ROM A/B/C Checksums listed on the chart below were determined by running the MEMTEST program (which was supplied on TRSDOS disks) against each ROM under TRS32(*). If they are in bold that means that the value was one of the checksums which the program flagged as valid checksums. There is 1 ROM C after which we don’t have … checksum 40E0. HOWEVER … Matthew Reed advised that TRS32 counters many hacks and equalizes them, making the checksum different than it actually is. When I ran a MEMTEST under Matthew’s DOS emulator I got a different checksum than TRS32, and yet another checksum when I ran it under Dave Keil’s emualtor (using DOSBOX, the only way to run Dave’s emulators at this point). With this, the checksums below are unreliable. The CRC-32 and MD5 checksums are present so that you can match any ROMs you have with the chart. Special Thanks to Matthew Reed who took the time to analyze the Radio Shack ROMs below and who then wrote up a wonderful explanation of the differences, and also to those who have found and dumped some previously missing ROMs including Kurt Baumgardner, Katz, and John Benson. Notes: Heavily Patched with Odd Changes including incorrect processing of JP/JR. If you have this ROM, you should not use it. If you have a Model I and want to dump your ROM for analysis, you can use the following program. Note, it takes about 30 minutes to run on a Model I, which is why the counters/screen updates are present. If you do not wish to key all that in, and don’t mind staring at a blank screen for 30 minutes, just don’t type in the italicized lines. Remember to use a disk with at least 13K free (and to adjust line 10 to point to that drive) or you will run out of space and have to start all over. David Keil’s emulators are certainly useable. I run them all the time. I use Microsoft Virtual PC, which is a free download from MS. VPC can run all kinds of things – DOS, Linux, Windows 95/98/2000/XP/Vista/7, OS/2, even Mac OS X etc. etc. Sort of like DOSBOX but with way more capabilites. You install DOS in it, then fire up your virtual DOS and install the emulator and your .DSK files onto the virtual C drive. Nothing like seeing LDOS boot up full screen on a 24″ LCD! Dan – The issue is that Dave’s emulators are not otherwise compatible with XP and beyond. They can be run under DOSBOX of Virtual PC, but the point is that those are a LOT of hurdles to run an abandoned emulator, particularly when there are plenty of current ones. 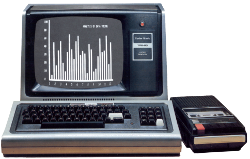 David’s emulator does only 2 things that no other emulator does, and I do run DOSBOX to use those: It has Model III 1500 Baud implementation, and it can run the TRS-80 at full PC speeds without loss of keyboard or disk. Other than those 2 things, there are plenty of emulators which do not require extraordinary measures to run. where could i find this memtest tool? i have a trsdos disk image for the model4, but i cannot find it. is it on a separate disk?